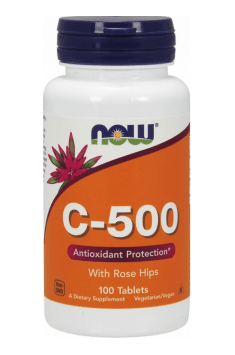 C-500 with Rose Hips 100 tab. There has been a lot of controversy lately when it comes to the right dosage of vitamin C. According to many researchers, the recommended consumption of the vitamin means, in fact, the minimal dosage, necessary for the normal functioning of the organism; as a result, the dosage can prove insufficient for obtaining maximum health benefits. The demand for vitamin C is an individual feature and the dosage should be adjusted to every person separately. There is a method for checking what dosage the organism needs consisting in taking a dose of vitamin C every 15 minutes until the organism is filled with it, which manifests itself through a laxative effect.